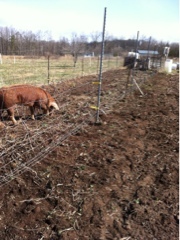 The pigs have cleared a size able area that will be planted with sweet corn in a few months. We plant a shoepeg corn...the rows of corn on the ear are random, the top is tighter wound...because growing corn without chemicals is really tough. The less perfect looking, older varieties of shoe peg corn are tougher for the bugs to get into, and growers report success. Corn grows tall with shallow roots, so toppling over in storms is a problem. And as they ripen we must keep the cattle away from the area, as we have learned the hard way the herd will break through electric fencing to get in and eat the corn, stalks, ears, husks, tassels and all, in 10 minutes or less. Sweet corn never goes on the list of things we offer as part of the CSA. While we grow it every year we have never distributed any. Another season, we will try again! This particular fence line has never been planted. This is the first year it has been cleared down to bare ground. Today the last of the pea seeds will go along this fence line: snow peas and snap peas have already gone in, in other locations, this will be English peas, the ones that, popped from their shells right after picking, into a sauce pan with a bit of butter, salt and pepper...yum. More complicated things can be done with English peas, but the first harvest gets a simple, quick cook.